Posted by James Fuller on 29 April. There’s a lot to think about, and a lot of responsibilities on your shoulders. For most self-employed people, it can be hard to keep on top of the admin burden, not to mention being able to maintain a consistent income. Part of the issue is that the systems and processes in place for self-employed people tend to punish, rather than encourage self-employment. When you’re self-employed it can be hard to get a mortgage, hard to get a loan and getting insurance can be a frustrating process. Governments and banks haven’t updated their thinking about self-employment for over 50 years now. 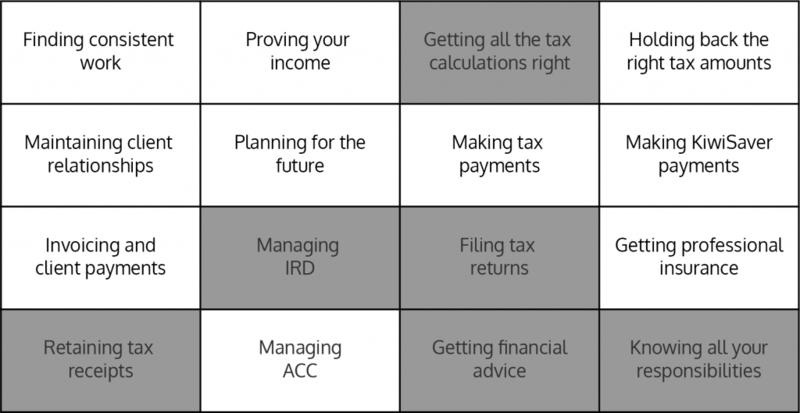 Everything requires deep levels of input or understanding, and as a self-employed person you’re expected to know all your tax and compliance responsibilities from day one. 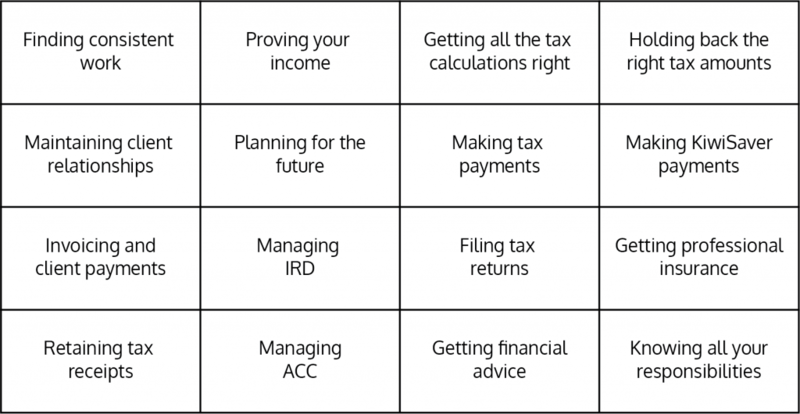 What things do Accountants or Bookkeepers tend to do? In general, they will work out what you need to pay for Income Tax and GST, and tell you when to pay it. They’ll help you by filing your Income Tax and GST returns, although there will still be a fair amount of time required from you. On the whole, accountants don’t tend to handle anything to do with ACC, so all of the calculations and payments to ACC will fall to you. 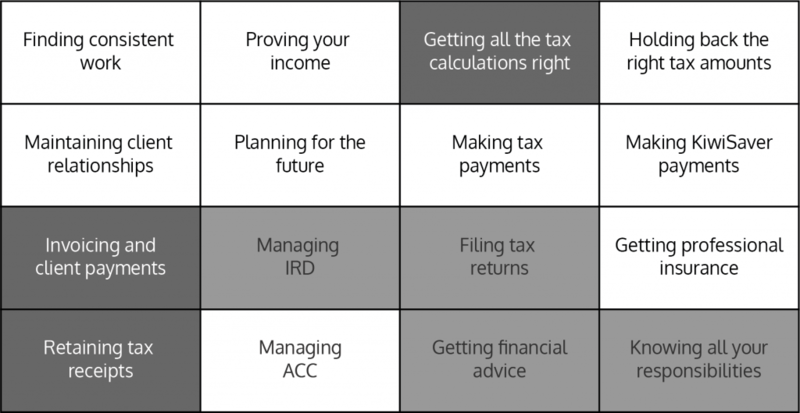 The main value of having an accountant is the potential opportunity to learn about what your tax and compliance responsibilities are, and to get access to some financial advice (it’s worth noting that some accountants are not comfortable or aren’t permitted to provide financial advice though). What things can Accounting Software do? In the last few years, the Accounting Software market has really come into it’s own. If you get an Accountant these days, chances are they’ll recommend you pay extra to get an Accounting Software subscription as well. Accounting software can help you store and classify your business receipts, can help you raise invoices and keep track of your income and expenditure. 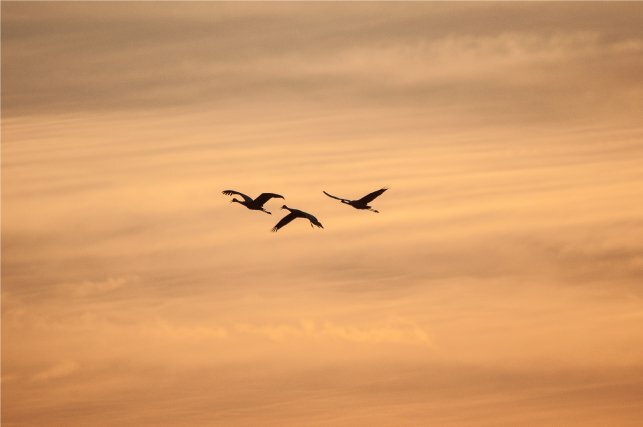 Where they fall short is when it comes to helping you stay on track with your tax money, and Accounting Software doesn’t actually make any payments for you. Whilst software can help you file a tax return, it still requires you to reconcile transactions, to put in effort yourself, and most of the time it requires an Accountant to sense-check the data for you. Accounting Software really helps make it easier for your accountant to work on your behalf. Being self-employed is hard enough, without the tax and compliance elements requiring your time and effort. At Hnry, we take everything on for you, achieving more than Accountants and Accounting Software combined. We do all the calculations, make all the payments, and even give you a payslip every time you get paid - so you can prove your income to anyone at any time of the year. 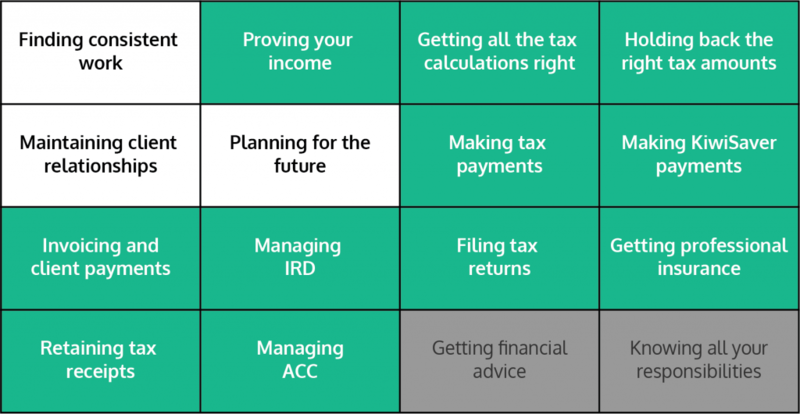 Hnry manages your relationships with ACC, helps you get Professional Insurances, and gives you the confidence that you’re only ever paying the exact right amount of tax, every time you get paid. Hnry turns self-employment into a simple, pay-as-you-earn experience that anyone can take advantage of, without having to learn the entire tax system. Hnry provides a more complete service than both Accountants or Accounting Software, and for a large number of self-employed people, Hnry comes in cheaper. Using Hnry means you won’t need to pay for any other solutions, or deal with multiple organisations - we’re a one-stop-shop for all your self-employment needs. Just think of us like ‘self-employment in a box’. Whilst we don’t give Financial Advice at Hnry, we work closely with providers who do, and we connect our customers to these organisations as and when they require it. We also don’t set out to teach you all the ins and outs of tax and compliance either - we just make sure that you have confidence that things are being done correctly, so that you don’t need to learn any of that yourself. We’ve learned all the rules, so that you don’t have to. With Hnry, the only things you need to worry about are the most important things - finding client work, maintaining relationships with clients, and planning for the future. Perhaps you can even spend more time with friends and family, now that you don’t need to continually reconcile transactions, work out tax payments and manage all the admin yourself? No-one becomes self-employed to wade through mountains of admin - but it used to be seen as a necessary evil. Self-employment should be about forging a path, following a career or just doing good work. We’re here to make sure that everyone can get the opportunity to do that, by giving them back their freedom.